Betstar.com.au is offering a special bonus code to new customers. With the Betstar bonus code — BETMAX —, you can enjoy deposit match up to $250. This bonus code is valid from 01/01/2019 to 31/12/2019. What can I get with the Betstar bonus code? Note: Only Australian residents are eligible to participate in Promotional Offers. Residents of New South Wales, South Australia, Western Australia and Victoria may be ineligible to participate in some other Promotional Offer types, unless they opened their Account prior to receiving notice of the Promotional Offer. The bonus code is not necessary to claim the promotion. After registration, you have 14 days to place your first bet. Your matched bet will appear in your account after the match is settled. This bonus cannot be used along with other promo codes. There is a 2x wagering requirement on bonus funds. When will the next female pope be anointed? Betstar.com.au have launched “Pick your Own Odds™”, where you can select the odds you want! On selected horse races with fixed odds Betstar customers have the opportunity to increase the odds in their favour. If you think you’ve got a sure-fire winner you can pick the margin it wins by and greatly increase the odds. If you think your favourite horse looks vulnerable you can increase your chances of winning by backing the whole field with one simple bet. You can also make a multi bet by using Betstar’s Quick Multi bet slip. Favourite V Field is available on thoroughbred, harness and greyhound racing. Betstar guarantees the best tote odds every day. You can get Best Tote or Starting Price dividends (whichever is higher) on all Australian thoroughbred meetings. For more information on sports betting, check out must-read information. Betstar offers live betting for a wide range of sports not just in Australia but also internationally. Some sports that are currently available are basketball, tennis, cricket, soccer, golf and volleyball. For certain events, various markets may be available. Currently, Betstar doesn’t provide any live sports streaming options or live score updates. Due to government regulation, all live bets must be confirmed via phone call. To get started with live betting on Betstar , just call 1300 238 722. By downloading Betstar’s app you can enjoy all the perks of the best of sports wherever you are. 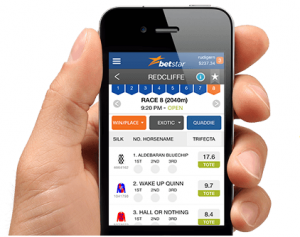 Convenient and easy to use, the app gives you the flexibility and expertise of Betstar.com.au. The Betstar application is available for iOS (iPhone & iPad) and Android. Click here to download. Don’t forget that you can use the Betstar bonus code even when you sign up via mobile. Betstar provides customer support via email support@betstar.com.au or call 1300 238 782. All in all, Betstar is a great option if you’re looking for a bookmaker that offers generous odds on a wide range of markets. One cool feature is the Betstar Card which provides their customers access to their winnings and balances right away via cash from any ATM, plus the ability to make point-of-sale purchases as you would with any normal EFTPOS, Visa debit card or Paywave. The downside is the lack of a cash out feature which gives customers the ability to take a reduced profit (or loss) based on current live event odds. Is there a Betstar bonus code currently available? Who can claim this Betstar promo code offer? New customers who are at least 18 years of age are eligible. You must be an Australian resident to participate in Promotional Offers. Residents of New South Wales, South Australia, Western Australia and Victoria may be ineligible to participate in some other Promotional Offer types. 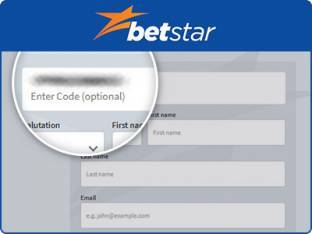 No, there is no mobile-specific bonus but you can still use the Betstar bonus code when signing up on your mobile. Can I claim this Betstar sign up bonus in addition to other current offers? No, you can’t claim this promo in addition to other offers. I can’t seem to obtain the Betstar bonus code, what should I do? Contact customer support via email support@betstar.com.au or call 1300 238 782.